Q: I have a question about a 2003 softail FXST. I put ten inch ape hangers on and didn’t remove any wires. Now turn signals stay on and the horn doesn’t work. Just in need of some ideas to give a try to get this problem fixed. The wires were never even unhooked when the handlebars where switched. A: Remove your clutch perch and open up your left side switch housings. Your harness may be pinched. You should also inspect your right side harness. Some handlebars are specifically made for internal wiring only. If you try to run wiring externally on this type of handlebar, your harness can easily be pinched or crushed. 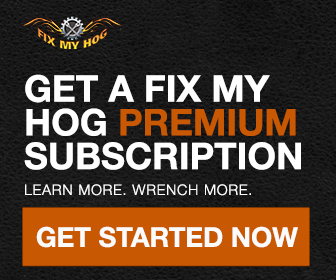 I am glad I am a member I am learning a lot l will my friends about fix my hog website and thanks a lot for the great video s.